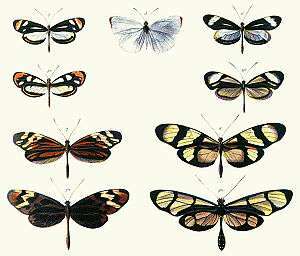 Plate from Bates 1861, illustrating Batesian mimicry between Dismorphia species (top row and third row) and various Ithomiini (Nymphalidae) (second row and bottom row). A non-Batesian species, Pseudopieris nehemia, is in the centre. Batesian mimicry is the most commonly known and widely studied of mimicry complexes, such that the word mimicry is often treated as synonymous with Batesian mimicry. There are many other forms however, some very similar in principle, others far separated. It is often contrasted with Müllerian mimicry, a form of mutually beneficial convergence between two or more harmful species. However, because the mimic may have a degree of protection itself, the distinction is not absolute. It can also be contrasted with functionally different forms of mimicry. Perhaps the sharpest contrast here is with aggressive mimicry, where a predator or parasite mimics a harmless species, avoiding detection and improving its foraging success. The imitating species is called the mimic, while the imitated species (protected by its toxicity or foul taste) is known as the model. The predatory species mediating indirect interactions between the mimic and the model is variously known as the [signal] receiver, dupe or operator. By parasitizing the honest warning signal of the model, the Batesian mimic gains an advantage, without having to go to the expense of arming itself. The model, on the other hand, is disadvantaged, along with the dupe. If impostors appear in high numbers, positive experiences with the mimic may result in the model being treated as harmless. At higher frequency there is also a stronger selective advantage for the predator to distinguish mimic from model. For this reason, mimics are usually less numerous than models, an instance of frequency dependent selection. Some mimetic populations have evolved multiple forms (polymorphism), enabling them to mimic several different models and thereby to gain greater protection. Batesian mimicry is not always perfect. A variety of explanations have been proposed for this, including limitations in predators' cognition. Batesian mimicry need not involve visual mimicry, but can employ deception of any of the senses. While visual signals have attracted most study, some moths mimic the ultrasound warning signals sent by unpalatable moths to bat predators, constituting auditory Batesian mimicry. Henry Walter Bates described the form of mimicry that bears his name in 1861. Henry Walter Bates: (1825–1892) was an English explorer-naturalist who surveyed the Amazon Rainforest with Alfred Russel Wallace in 1848. While Wallace returned in 1852, Bates remained for over a decade. His field research included collecting almost a hundred species of butterflies from the families Ithomiinae and Heliconiinae, as well as thousands of other insects specimens. In sorting these butterflies into similar groups based on appearance, inconsistencies began to arise. Some appeared superficially similar to others, even so much so that Bates could not tell some species apart based only on wing appearance. However, closer examination of less obvious morphological characters seemed to show that they were not even closely related. Shortly after his return to England he read a paper on his theory of mimicry at a meeting of the Linnean Society of London on the 21st of November 1861, which was then published in 1862 as 'Contributions to an Insect Fauna of the Amazon Valley' in the society's Transactions. He elaborated on his experiences further in The Naturalist on the River Amazons. Bates put forward the hypothesis that the close resemblance between unrelated species was an antipredator adaptation. He noted that some species showed very striking coloration, and flew in a leisurely manner, almost as if taunting predators to eat them. He reasoned that these butterflies were unpalatable to birds and other insectivores, and were thus avoided by them. He extended this logic to forms that closely resembled such protected species, mimicking their warning coloration but not their toxicity. This naturalistic explanation fitted well with the recent account of evolution by Alfred Russel Wallace and Charles Darwin, as outlined in his famous 1859 book The Origin of Species. Because this Darwinian explanation required no supernatural forces, it met with considerable criticism from anti-evolutionists, both in academic circles and in the broader social realm. 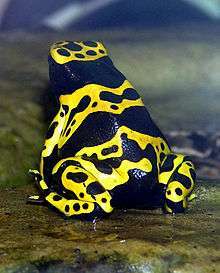 The Yellow-banded Poison Dart frog Dendrobates leucomelas has conspicuous aposematic coloration. Most living things have predators and therefore are in a constant evolutionary arms race to develop antipredator adaptations, while the predator adapts to become more efficient at defeating the prey's adaptations. Some organisms have evolved to make detection less likely, for example by nocturnality and camouflage. Others have developed chemical defences such as the deadly toxins of certain snakes and wasps, or the noxious scent of the skunk. Such prey often send clear and honest warning signals to their attackers with conspicuous aposematic (warning) patterns. The brightness of such warning signs is correlated with the level of toxicity of the organism. In Batesian mimicry, the mimic effectively copies the coloration of an aposematic animal, known as the model, to deceive predators into behaving as if it were distasteful. The success of this dishonest display depends on the level of toxicity of the model and the abundance of the model in the geographical area. The more toxic the model is, the more likely it is that the predator will avoid the mimic. The abundance of the model species is also important for the success of the mimic because of frequency dependent selection. When the model is abundant, mimics with imperfect model patterns or slightly different coloration from the model are still avoided by predators. This is because the predator has a strong incentive to avoid potentially lethal organisms, given the likelihood of encountering one. However, in areas where the model is scarce or locally extinct, mimics are driven to accurate aposematic coloration. This is because predators attack imperfect mimics more readily where there is little chance that they are the model species. Frequency dependent selection may also have driven Batesian mimics to become polymorphic in rare cases where a single genetic switch controls appearance, as in the swallowtail butterflies (the Papilionidae). A well-known mimic, the viceroy (top) resembles the noxious monarch (bottom). Once thought to be a Batesian mimic, the viceroy is more unpalatable than the monarch, making this a case of Müllerian mimicry. Batesian mimicry is a case of protective or defensive mimicry, where the mimic does best by avoiding confrontations with the signal receiver. It is a disjunct system, which means that all three parties are from different species. Batesian mimicry stands in contrast to other forms such as aggressive mimicry, where the mimic profits from interactions with the signal receiver. One such case of this is in fireflies, where females of one species mimic the mating signals of another species, deceiving males to come close enough for them to eat. Mimicry need not involve a predator at all though. Such is the case in dispersal mimicry, where the mimic once again benefits from the encounter. For instance, some fungi have their spores dispersed by insects by smelling like carrion. In protective mimicry, the meeting between mimic and dupe is not such a fortuitous occasion for the mimic, and the signals it mimics tend to lower the probability of such an encounter. A case somewhat similar to Batesian mimicry is that of mimetic weeds, which imitate agricultural crops. In weed or Vavilovian mimicry, the weed survives by having seeds which winnowing machinery identifies as belonging to the crop. Vavilovian mimicry is not Batesian, because man and crop are not enemies. Another analogous case within a single species has been termed Browerian mimicry (after Lincoln P. Brower and Jane Van Zandt Brower). This is a case of bipolar (only two species involved) automimicry; the model is the same species as its mimic. Equivalent to Batesian mimicry within a single species, it occurs when there is a palatability spectrum within a population of harmful prey. For example, Monarch (Danaus plexippus) caterpillars feed on milkweed species of varying toxicity. Some feed on more toxic plants, and store these toxins within themselves. The more palatable caterpillars thus profit from the more toxic members of the same species. Another important form of protective mimicry is Müllerian mimicry, discovered by and named after the naturalist Fritz Müller. In Müllerian mimicry both model and mimic are aposematic, so mimicry may be mutual, does not necessarily[lower-alpha 1] constitute a bluff or deception, and as in the wasps and bees may involve many species in a mimicry ring. In imperfect Batesian mimicry, the mimics do not exactly resemble their models. Many reasons have been suggested for this. Imperfect mimics may simply be evolving towards perfection. They may gain advantage from resembling multiple models at once. Humans may evaluate mimics differently from actual predators. Mimics may confuse predators by resembling both model and nonmimic at the same time (satiric mimicry). Kin selection may enforce poor mimicry. The selective advantage of better mimicry may not outweigh the advantages of other strategies like thermoregulation or camouflage. Only certain traits may be required to deceive predators; for example, tests on the sympatry/allopatry border (where the two are in the same area, and where they are not) of the mimic Lampropeltis elapsoides and the model Micrurus fulvius showed that color proportions in these snakes were important in deceiving predators, but that the order of the colored rings was not. Tiger moths like this Cycnia tenera are aposematic by sound, emitting ultrasonic warning signals. They are mimicked by pyralid moths, which are not foul-tasting but emit similar sounds. Predators may identify their prey by sound as well as sight; mimics have accordingly evolved to deceive the hearing of their predators. Bats are nocturnal predators that rely on echolocation to detect their prey. Some potential prey are unpalatable to bats, and produce an ultrasonic aposematic signal, the auditory equivalent of warning coloration. 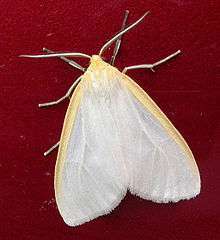 In response to echolocating red bats and big brown bats, tiger moths such as Cycnia tenera produce warning sounds. Bats learn to avoid the harmful moths, but similarly avoid other species such as some pyralid moths that produce such warning sounds as well. Acoustic mimicry complexes, both Batesian and Müllerian, may be widespread in the auditory world. ↑ Müllerian mimicry in its simplest form is not a bluff at all, but since toxicity is relative, there is a spectrum of mimicry from Batesian to Müllerian. 1 2 Bates, Henry Walter (1861). "Contributions to an insect fauna of the Amazon valley. Lepidoptera: Heliconidae". Transactions of the Linnean Society. 23 (3): 495–566. doi:10.1111/j.1096-3642.1860.tb00146.x. ; Reprint: Bates, Henry Walter (1981). "Contributions to an insect fauna of the Amazon valley (Lepidoptera: Heliconidae)". Biological Journal of the Linnean Society. 16 (1): 41–54. doi:10.1111/j.1095-8312.1981.tb01842.x. 1 2 Bates, Henry Walter (1863). The Naturalist on the River Amazons. John Murray. 1 2 3 4 Pasteur, Georges (1982). "A classificatory review of mimicry systems". Annual Review of Ecology and Systematics. 13: 169–199. doi:10.1146/annurev.es.13.110182.001125. ↑ Sherrat, T. N. (2002). "The coevolution of warning signals". Proceedings of the Royal Society B. 269: 741–746. doi:10.1098/rspb.2001.1944. ↑ Caro, T. (2014). "Antipredator deception in terrestrial vertebrates". Current Zoology. 60: 16–25. ↑ Kikuchi, D. W.; Pfennig, D. W. (2009). "High-model abundance may permit the gradual evolution of Batesian mimicry: an experimental test". Proceedings of the Royal Society B. 277: 1041–1048. doi:10.1098/rspb.2009.2000. ↑ Akcali, C. K. & D. W. Pfennig. (2014). "Rapid evolution of mimicry following local model extinction". Biology Letters. 10: 4. doi:10.1098/rsbl.2014.0304. ↑ Joron, Mathieu; Mallet, James L. B. (11 November 1998). "Diversity in mimicry: paradox or paradigm?" (PDF). Tree. 13 (11): 461–466. doi:10.1016/s0169-5347(98)01483-9. ↑ Ritland, D.; L. P. Brower (1991). "The viceroy butterfly is not a Batesian mimic". Nature. 350 (6318): 497–498. Bibcode:1991Natur.350..497R. doi:10.1038/350497a0. Retrieved 2008-02-23. Viceroys are as unpalatable as monarchs, and significantly more unpalatable than queens from representative Florida populations. 1 2 Vane-Wright, R. I. (1976). "A unified classification of mimetic resemblances". 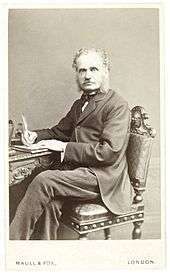 Biological Journal of the Linnean Society. 8: 25–56. doi:10.1111/j.1095-8312.1976.tb00240.x. ↑ Meyer, A (2006). "Repeating Patterns of Mimicry". PLoS Biol. 4 (10): e341. doi:10.1371/journal.pbio.0040341. PMC 1617347 . PMID 17048984. 1 2 Brower, L. P. (1970) Plant poisons in a terrestrial food chain and implications for mimicry theory. In K. L. Chambers (ed) Biochemical Coevolution Corvallis, OR: Oregon State Univ. pp. 69-82. ↑ Bell, William J.; Cardé, Ring T. (2013). Chemical Ecology of Insects. Springer. pp. 270–271. ISBN 978-1-4899-3368-3. [Consider the case where one monarch caterpillar is feeding on cardenolide-containing milkweed, the other not], with one being completely potent with regard to cardiac glycoside toxicity, the second not. The first will fit all of the characteristics for warning coloration, the second not. In fact, the second butterfly is a harmless Batesian mimic of the first, even though both belong to the same species. L. Brower, J. Brower, and Corvino (1967) have termed this phenomenon automimicry, though others have suggested that Browerian mimicry would be a better term (Pasteur, 1972; Bees, 1977; Rothschild, 1979). Note that all of the antagonisms raised by Batesian mimicry will arise, but now the model and the mimic are conspecific. 1 2 Brower, L. P.; Ryerson, W. N.; Coppinger, L. L.; Glazier, S. C. (1968). "Ecological chemistry and the palatability spectrum". Science. 161 (3848): 1349–51. Bibcode:1968Sci...161.1349B. doi:10.1126/science.161.3848.1349. ↑ Holloway, G.; Gilbert, F.; Brandt, A. (2002). "The relationship between mimetic imperfection and phenotypic variation in insect colour patterns". Proceedings of the Royal Society B. 269 (1489): 411–416. doi:10.1098/rspb.2001.1885. ↑ Edmunds, M. (2000). "Why are there good and poor mimics?". Biological Journal of the Linnean Society. 70 (3): 459–466. doi:10.1111/j.1095-8312.2000.tb01234.x. ↑ Dittrich, W.; Gilbert, F.; Green, P.; McGregor, P.; Grewcock, D. (1993). "Imperfect mimicry – a pigeons perspective". Proceedings of the Royal Society B. 251 (1332): 195–200. doi:10.1098/rspb.1993.0029. ↑ Howse, P. E.; Allen, J. A. (1994). "Satyric mimicry – the evolution of apparent imperfection". Proceedings of the Royal Society B. 257 (1349): 111–114. doi:10.1098/rspb.1994.0102. ↑ Johnstone, R. A. (2002). "The evolution of inaccurate mimics". Nature. 418 (6897): 524–526. Bibcode:2002Natur.418..524J. doi:10.1038/nature00845. PMID 12152077. ↑ Harper, GR; Pfennig, DW (2007). "Mimicry on the edge: Why do mimics vary in resemblance to their model in different parts of their geographical range?". Proceedings of the Royal Society B. 274 (1621): 1955–61. doi:10.1098/rspb.2007.0558. PMC 2275182 . PMID 17567563. ↑ Kikuchi, David W.; Pfennig, David W. (December 2010). "Predator Cognition Permits Imperfect Coral Snake Mimicry". The American Naturalist. 176 (6): 830–834. doi:10.1086/657041. PMID 20950143. 1 2 Barber, J. R.; Conner, W. E. (2007). "Acoustic mimicry in a predator prey interaction". Proceedings of the National Academy of Sciences of the United States of America. 104 (22): 9331–9334. Bibcode:2007PNAS..104.9331B. doi:10.1073/pnas.0703627104. PMC 1890494 . PMID 17517637. ↑ Dawkins, Richard (1986). The Blind Watchmaker. W. W. Norton. ISBN 0-393-31570-3. Evans, M. A. (1965). "Mimicry and the Darwinian Heritage". Journal of the History of Ideas. 26 (2): 211–220. doi:10.2307/2708228. For a historical perspective. Wickler, W. (1968) Mimicry in Plants and Animals (Translated from the German) McGraw-Hill, New York. ISBN 0-07-070100-8 Especially the first two chapters. Edmunds, M. 1974. Defence in Animals: A Survey of Anti-Predator Defences. Harlow, Essex & NY: Longman 357 p. ISBN 0-582-44132-3 Chapter 4 discusses this phenomenon. Pasteur, Georges (1982). "A classificatory review of mimicry systems". Annual Review of Ecology and Systematics. 13: 169–199. doi:10.1146/annurev.es.13.110182.001125. A detailed discussion of the different forms of mimicry. Ruxton, G. D.; Speed, M. P.; Sherratt, T. N. (2004). Avoiding Attack. The Evolutionary Ecology of Crypsis, Warning Signals and Mimicry. Oxford: Oxford University Press. ISBN 0-19-852860-4 Chapter 10 and 11 provide an up-to-date synopsis. Review of Contributions to an insect fauna of the Amazon valley by Charles Darwin The Complete Works of Charles Darwin Online.